Webinar presented Thursday, April 18, 2013. Click here to view the recorded webinar (or paste the link: http://carmenconnect.osu.edu/p83q8zw20v7/ into your browser). The Boundary Waters of the Superior National Forest has become familiar to firefighters across North America ever since the blowdown event on July 4th, 1999. The fire history since then provides an excellent story line for many of the fire science topics we share an interest in. On September 12th, 2011, the Pagami Creek fire grew by more than 80,000 acres, becoming the largest chapter so far. 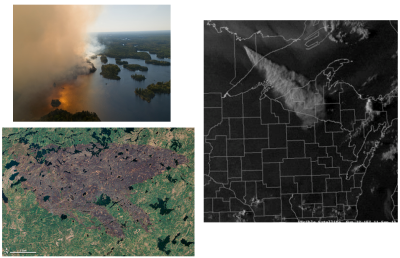 So far in this webinar season, Doug Shinneman explored disturbance regimes on the landscape of the border lakes region and Brian Sturtevant reported on the fire effects research their group is pursuing on the Pagami Creek Fire. In this concluding webinar for the 2012-2013 season, Tim Sexton will explore the lessons learned by fire managers in the context of this historic wildland fire that burned in the summer and fall of 2011. Tim was, at the time, Ranger for the LaCroix District on the Superior National Forest and served as a line officer for the fire. Pagami Creek Fire Entrapments: Facilitated Learning Analysis. USFS Eastern Region, Superior National Forest, Minnesota. Incident date: 12 September 2011. 1. To Test your computer internet connection and compatibility with adobe connect, click here (or paste http://admin.adobeconnect.com/common/help/en/support/meeting_test.htm into your brower ) and follow the prompts. You will need the browser add-in only if you anticipate speaking during the webinar. 2. You will need to use the speaker output from your computer, so make sure you know how to control your speaker volume and attach external speakers for better performance. We will prompt you to type questions in throughout the session. 3. For more information about participating in an adobe connect session, watch this 2 minute video (http://www.adobe.com/go/lrvid_cnn_803_en) or download this document.